Cissampelos sympodialis Eichl is used in folk medicine for the treatment of various inflammatory diseases; several alkaloids have been isolated from this species and some of them have anti-allergic, immunomodulatory and spasmolytic activities. Treatment of rats with the total tertiary alkaloid fraction showed an antidepressant effect. One of the depression causes can be the deficiency of monoamines, which is a factor displayed in patients with Alzheimer's disease. Theoretical studies using in silico methods have aided in the process of drug discovery. 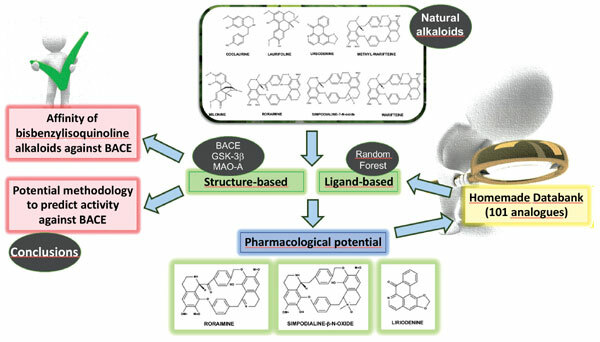 From this perspective, we applied ligand-based-virtual associated with structure-based-virtual screening of alkaloids from C. sympodialis Eichl and 101 derivatives proposed by us are promising leads against some important targets (BACE, GSK-3β and MAO-A). From the ChEMBL database, we selected a diverse set of 724, 1898 and 1934 structures, which had been tested against BACE, GSK-3β and MAO-A, to create Random Forest (RF) models with good overall prediction rate, over 78%, for cross-validation and test set. Compounds 24 and 47 presented activity against GSK-3β and MAO-A simultaneously. The natural alkaloids roraimine and simpodialine-β-N-oxide presented activity against BACE and liriodenine against MAO-A. The top 20 compounds with best docking performance per enzyme were selected and validated through the RF model. All 9 compounds classified as active in RF model for BACE are bisbenzylisoquinoline alkaloids and were present in the top docking scoring, demonstrating a consensus on results. Affinities of bisbenzylisoquinoline alkaloids, including two secondary metabolites (roraimine and simpodialine-β-N-oxide), with BACE suggest that this skeleton can be used as a model to design new antagonists of this enzyme. Keywords: Alkaloids, Cissampelos sympodialis, Warifteine, Alzheimer, Virtual screening, Docking, Machine learning. Keywords:Alkaloids, Cissampelos sympodialis, Warifteine, Alzheimer, Virtual screening, Docking, Machine learning. Abstract:Cissampelos sympodialis Eichl is used in folk medicine for the treatment of various inflammatory diseases; several alkaloids have been isolated from this species and some of them have anti-allergic, immunomodulatory and spasmolytic activities. Treatment of rats with the total tertiary alkaloid fraction showed an antidepressant effect. One of the depression causes can be the deficiency of monoamines, which is a factor displayed in patients with Alzheimer's disease. Theoretical studies using in silico methods have aided in the process of drug discovery. From this perspective, we applied ligand-based-virtual associated with structure-based-virtual screening of alkaloids from C. sympodialis Eichl and 101 derivatives proposed by us are promising leads against some important targets (BACE, GSK-3β and MAO-A). From the ChEMBL database, we selected a diverse set of 724, 1898 and 1934 structures, which had been tested against BACE, GSK-3β and MAO-A, to create Random Forest (RF) models with good overall prediction rate, over 78%, for cross-validation and test set. Compounds 24 and 47 presented activity against GSK-3β and MAO-A simultaneously. The natural alkaloids roraimine and simpodialine-β-N-oxide presented activity against BACE and liriodenine against MAO-A. The top 20 compounds with best docking performance per enzyme were selected and validated through the RF model. All 9 compounds classified as active in RF model for BACE are bisbenzylisoquinoline alkaloids and were present in the top docking scoring, demonstrating a consensus on results. Affinities of bisbenzylisoquinoline alkaloids, including two secondary metabolites (roraimine and simpodialine-β-N-oxide), with BACE suggest that this skeleton can be used as a model to design new antagonists of this enzyme.